After thirteen years away from the club he has supported since a boy, Jim Leishman was this afternoon unveiled as the clubs new General Manager/Chief Executive at a press conference held by John Yorkston and Jimmy Calderwood. 26th July 1990. 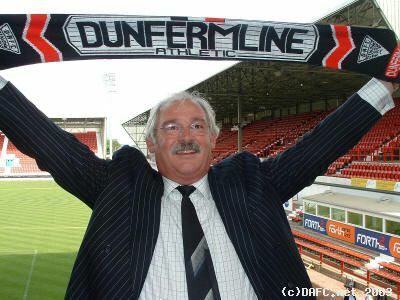 That was the last time Jim Leishman was employed by DAFC until today. Now, he has finally returned after thirteen years of unfounded rumours. After a football career that started with the Pars way back in 1971, he has never hidden his love for the club. A double leg break administered by Jim Jeffries of Hearts was the real end of his playing career, before a couple of comebacks failed with both Dunfermline and latterly Cowdenbeath. His management career started as a coach with Kelty Hearts in 1980, before rejoining Cowdenbeath in 1981 as a coach. on the 23rd July 1982, Leishman came back to Dunfermline at the ripe age of 28. Little over a year later and with hardly any experience, the 29 year old reserve team coach was handed the job of manager at Dunfermline Athletic. With the club part time and facing relegation, Leishman was facing an uphill battle from the word go. The inevitable followed and Dunfermline were to be relegated to the bottom division. After a poor season in 1983/84, things started to change the next year with promotion narrowly missed out on, with a last day of the season heartache. Season 85/86 saw the club win a leage title for the first time in 60 years when they lifted the second division trophy. 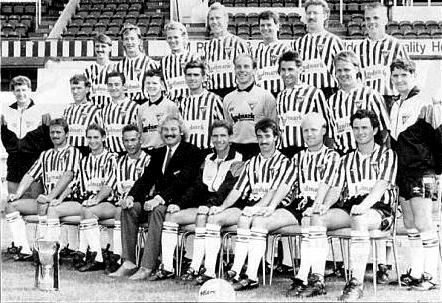 A successive promotion followed and Dunfermline became the first Fife club to play in the Premier division in season 87/88. After another relegation the next season, a hard fought battle saw the Pars win the First Division title for the first time in 88/89. Much has been said previously about Leishman`s departure from the club the following year. Thousands (including myself) took part in the march to try and reinstate him after his sudden departure from the club. Now, he is finally back at the club that he continues to talk about if you give him half a chance! Hopefully this move by DAFC can now move forwards yet again, with Jimmy Nicholl and Jimmy Calderwood in charge on the pitch and Jim Leishman in charge off it. On paper, it looks to be a "dream team" combination. Only time will tell if the fans who have slowly, but very surely, drifted away from the club will come back.